007: From Russia with Love (aka 007: Liebesgrüsse aus Moskau in Germany and 007: Bons Baisers de Russie in France) is a video game featuring Ian Fleming's secret agent, James Bond. The game is based on the 1957 novel and the 1963 film of the same name. The game follows the storyline of the book and film, albeit adding in new scenes to make the game more action-oriented, as well as changing the affiliation of the main villains. Additionally, it features many elements of earlier Bond films to recreate the feel of the era such as the jet pack from Thunderball (1965) and the Aston Martin DB5 that debuted in Goldfinger (1964). 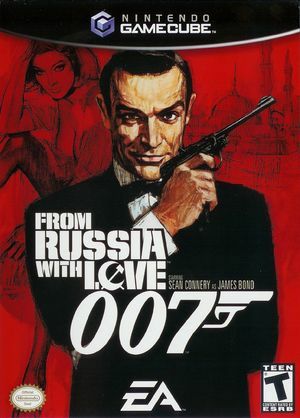 From Russia with Love is also notable in that it is the first video game to use Sean Connery's likeness as James Bond and the first to include all new voice work by the actor. From Russia with Love is the last James Bond video game EA Games marketed before they lost the rights to Activision in 2006. 007: From Russia with Love uses the VP6 video codec, common in Electronic Arts' titles, causing it's videos to have vertical line artifacts and other glitches on NVIDIA graphics cards. The Software Render will display VP6 video correctly, but is typically too slow. Prior to 4.0-593 video output was completely scrambled, refer issue 5046. Rendering improved with 4.0-593 but a variety of glitches remain, refer issue 7193. VP6 rendering also reacts poorly to the Force Texture Filtering enhancements (and Anisotropic Filtering on NVIDIA), causing further scrambling. The graph below charts the compatibility with 007: From Russia with Love since Dolphin's 2.0 release, listing revisions only where a compatibility change occurred. 4.0.2 Linux Intel Core i5-5200 @ 2.2GHz Intel E4000 Full 30FPS, everything works, no drops etc. This page was last edited on 13 August 2018, at 20:58.